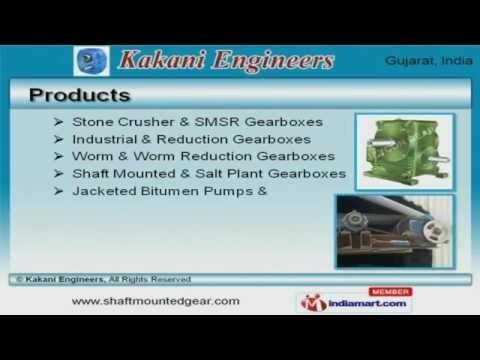 Welcome to Kakani Engineers, Manufacturer and Exporter of Industrial Gear Boxes and Pumps. The company was incepted in the year 1974, at Ahmedabad. Our Good financial position and TQM make us unique in the industry. Excellent after sales support, Client friendly payment and shipment options are the reasons behind our success. We offer a wide assortment of Shaft Mounted, Industrial and Reduction Gearboxes. Our Stone Crusher and S M S R Gearboxes are best in the industry amongst others. Industrial and Reduction Gearboxes offered by us are well known for their outstanding performance. We offer Worm and Worm Reduction Gearboxes that are available at industry leading prices. Along with that we offer Shaft Mounted and Salt Plant Gearboxes that are one of the best in the market. We also provide Jacketed Bitumen Pumps and Shaft Mounted Speed Reducers that are a class apart.